For the relief of dry, irritated or tired eyes. Provides quick moisturisation for the eye surface. Suitable for contact lens users. 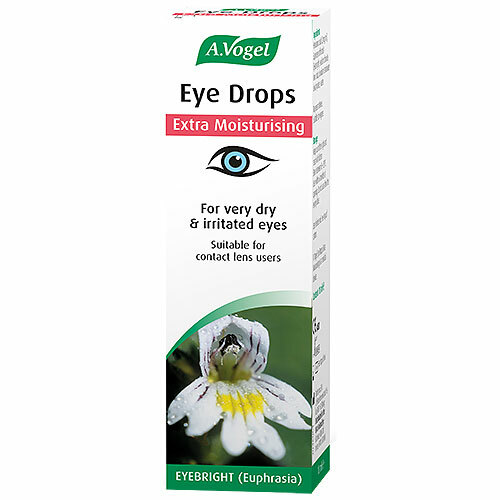 A Vogel Moisturising Eye Drops contain ingredients to refresh the eyes, helping to keep them moist whilst maintaining a liquid film. Hyaluronic acid (1 mg/ml), Euphrasia officinalis (Eyebright), Sodium chloride, Boric acid, Disodium tetraborate decahydrate, water. No preservatives. Adults:1 drop in each eye 4-5 times daily. The drops can be used for a maximum of 30 consecutive days. Children from the age of 12 years: 1 drop in each eye 1-2 times daily. Store between 8-25 Degrees Celsius. If your symptoms persist for more than 3 consecutive days without any improvement, or get worse, or if eyes become inflamed, you must contact your optician or healthcare professional. 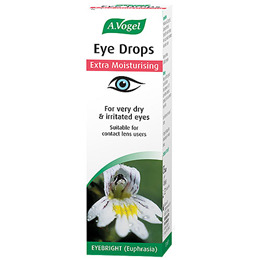 Below are reviews of A Vogel Extra Moisturising Eye Drops - 10ml by bodykind customers. If you have tried this product we'd love to hear what you think so please leave a review. I have great difficulty using the drops because I can't hold the bottle and press the plunger with one hand because the plunger is stiff drops work if I can get them in my eye ! Not bad, but doesn't completely help my dry eyes. Great product, moisturising and soothing. Especially when eyes are dry due to prolonged computer screen use. For the relief of dry, irritated or tired eyes. Provides quick moisturisation for the eye surface. Suitable for contact lens users.